Prepare a 9-inch springform pan for baking in a water bath by wrapping the bottom of the pan in a large single sheet of aluminum foil, making sure that the sides of the pan are fully covered by the foil. This is done to prevent the water bath from leaking into the bottom of the springform pan. To prepare the crust, combine crumbs, sugar and cinnamon in a bowl. Add melted butter and mix to combine well. Press mixture into the bottom of a 9-inch springform pan. Set aside. To prepare the filling, with a mixer, beat the cream cheese until very smooth. Add pumpkin puree, eggs, egg yolk, sour cream, sugar and spices and stir to combine. Add flour and vanilla. Beat together until well combined. Pour pumpkin mixture into the prepared springform pan. Spread out evenly. Place the springform pan in a baking pan large enough to hold the springform pan and also large enough to allow for water to surround the springform pan. Add about an inch of very hot water to the baking pan so it surrounds the pan. Bake in a 350 degree oven for one hour. Remove from the oven and the water bath and allow the cheesecake to cool to room temperature. (You can leave the cheesecake in the springform pan the entire time it is cooling and chilling.) Cover with plastic wrap but do not let the plastic wrap touch the top of the cheesecake or it will stick and peel the top layer. Refrigerate for 4 hours or overnight. 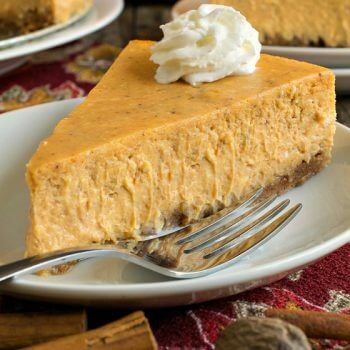 When ready to serve, remove the pumpkin cheesecake from the springform pan and cut into slices for serving.